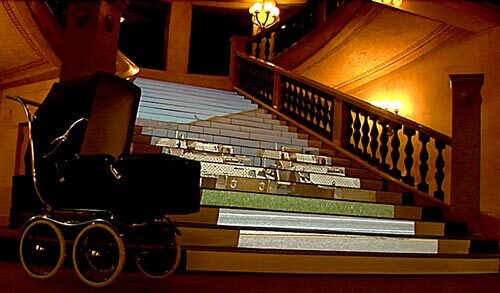 A baby in its carriage is falling down a flight of stairs…this image is burned into our cinematic memory, and provides the underlying theme for our staircase projection. The carriage scene appears in the climactic sequence in Brian DePalma’s “The Untouchables”, which was derived from the historically famous scene in Sergei Eisenstein’s “Battleship Potemkin”. In Cite Unscene, the carriage is a metaphor for something of our time that is fragile, precious, and in urgent need of protection. We have interviewed a number of people to find out what they value and believe is at risk of being lost or destroyed; the database of their responses functions as the fundamental source material for the images and the sounds in our piece. Computer analysis of the interviews is used to extract pitch inflection and precise rhythms. This data controls all of the synthesizer tracks comprising the soundscapes in the piece. Cite Unscene was commissioned by the Chicago Cultural Center for the Site Unseen Festival 2007.